Talented young Brazilian Pipo Derani is to contest the Cooper Tires British Formula 3 International Series this season with Double R Racing, it is confirmed today (Wednesday). The 17-year-old from Sao Paulo impressed the team, which has a long and impressive reputation for nurturing South American racing talent, in testing at the end of last year. “From his first run at Pembrey with us in October he demonstrated exactly the correct work ethic and we have high expectations for the coming season,” says team owner Anthony Hieatt. 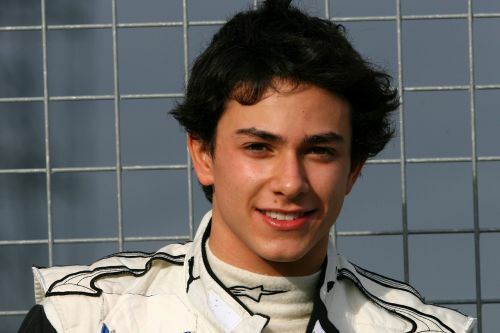 Pipo - full name Luis Felipe Derani - moved to Europe in 2009 after four seasons of success in Brazilian karting. He was a podium finisher in the North European Formula Renault series in ’09 and gained Formula 3 experience last year in the German domestic championship. “I’m delighted to be part of the Double R team,” said Derani. “In the short time we have been together I felt really comfortable with the team, and we get along very well. They are really competent in their work, and they believe in my potential. British Formula 3 has always been the strongest series for young drivers. With the three-race format and with events outside Britain, at tracks on which Formula 1 also races, it’s a tough challenge. As the series that has developed so many drivers for Formula 1, it is the most known Formula 3 series by the public and the media. This is a very competitive series, disputed by a strong group of drivers, as we are a generation that has raced together since our kart days, I already know some of the drivers really well. Double R Racing is the team behind Mike Conway’s 2006 British Formula 3 Championship-winning performance and has a long and successful association with a number of South American drivers, including the latest Brazilian to graduate to Formula 1, Bruno Senna. Pipo will return to the cockpit of his new Mercedes-powered Dallara following the mid-February conclusion of the winter testing moratorium. Double R Racing is expected soon to announce the identities of Derani’s team-mates. British Formula 3 - the opening rounds of which will take place at the Italian Grand Prix circuit of Monza in mid-April - is sponsored by US tyre manufacturer Cooper Tire and is further supported by Sunoco Racing Fuels, Anglo American Oil Company and OAMPS.